Comments: Watto sells used droids and mechanical parts in his shop on Tatooine. One of the droids for sale is R2-T0. 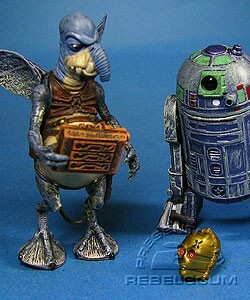 Watto is a repaint of 1999's EPISODE I Watto. R2-T0 is a repaint of 2005's ROTS R4-G9.